The Tribine is a revolutionary new machine that aims to fundamentally improve farmers’ harvesting efficiency. 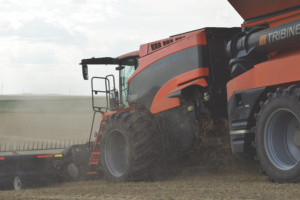 The machine is a huge combine–grain cart combination with articulated steering and full-time all-wheel drive. Its 1,000-bushel capacity reduces the need for frequent unloading. The company, which has been in business for 3½ years, designed the Tribine in only 6 months and is already integrating user feedback into its new production models. 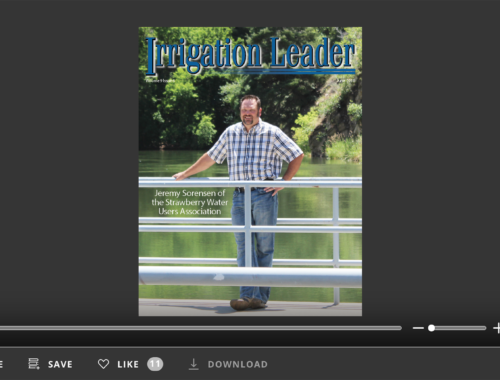 Greg Terjesen, Tribine’s vice president of sales and marketing, spoke with Irrigation Leader Editor-in-Chief Kris Polly about what makes the Tribine unique and what it can do. Kris Polly: Please give our readers a brief history of the Tribine. Greg Terjesen: The Tribine concept started with our founder, Ben Dillon, more than 20 years ago. His family has been farming in Indiana since 1840, and after he retired from private industry, he moved back to the family farm, only to find that he was put to work driving the tractor and pulling the grain cart around the field. Ben decided there had to be a better method than just having someone crisscrossing the field towing grain to trucks. He started working on different ideas and models—he actually has four early models in what he calls his museum, or what most people would call his barn, in Logansport, Indiana. Once he was satisfied with the concept, he established an engineering group here in Newton, Kansas, in a small downtown office. Once we got the concept down on paper, we moved into a facility in a new industrial park here in Newton where our production facility is now. About 6 months later, almost to the day, the first Tribine rolled off of the assembly line. Kris Polly: It took just 6 months from design to manufacture? Greg Terjesen: Right. We are a small startup, but many of us come from corporate America. We had 8 to 10 engineers working on the Tribine at the beginning. Half those engineers are also part-time farmers, and almost all of them had worked for Case, AGCO, or John Deere—all the major players in the agricultural industry. In addition, all our vendors and suppliers can be found in a 60-mile radius of Newton. It actually made for an ideal location. Kris Polly: Can you please tell our readers about the overall concept of the Tribine? Greg Terjesen: Well, commodity prices have dived: Corn used to trade at $7 or $8 a bushel; today that is down to $3.20. The drop in farmer income that represents has been a real challenge. At the same time, farmers are looking to increase their yield per acre, and there are a lot of people in the seed and the fertilizer industries who are working toward the same aim. One seed manufacturer, for example, is looking at twin-row planting: Instead of planting normally spaced rows, they are putting two rows next to each other. 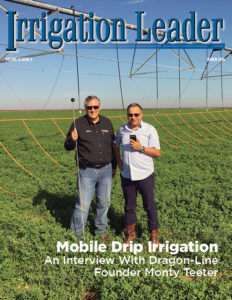 Now, as opposed to dry corn at 70 bushels an acre, some irrigated areas are already producing 250 bushels per acre, with 300 bushels per acre right on the horizon. It takes larger equipment to harvest such high-yield fields. 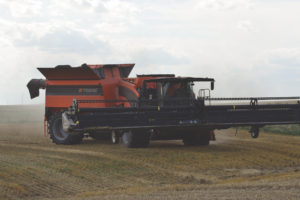 The original equipment manufacturers that are in the header business are looking at wider and more- efficient headers that can process more grain into the harvester at once. Other challenges farmers face today are increased operating costs and a labor shortage—it has even become a challenge for us to find labor for our shop. Fuel prices are going up, equipment costs are going up, labor costs are going up, and commodity prices are almost at their all-time low. So how do we help the farmer become more efficient and reduce his operating costs so he can make money at $3 a bushel of corn? That is where the Tribine comes in. Another challenge faced by farmers is compaction. The more a piece of equipment—whether it is a tractor, a combine, a grain cart, or a truck—crisscrosses a field, the more it compacts the soil. That can reduce the yield by 2–3 percent. If you have 200 bushels of corn per acre and you reduce that by 2 or 3 percent, that starts adding up and hitting you in the pocketbook, especially when you are farming 1,500–3,000 acres or more. 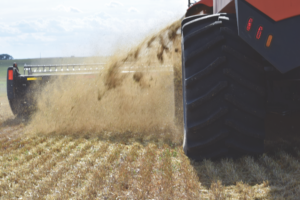 Kris Polly: So, the Tribine is an articulatedmachine that pulls its own grain cart. What is the storage capacity of its grain cart? Greg Terjesen: The grain cart on the Tribine is 1,000 bushels, not by coincidence: That is the same amount as a semi load. Competitor machines hover around 400 bushels, but their grain carts are on top of the engine and everything else as opposed to being pulled behind the machine. They can’t add much more height before affecting the machine’s stability. So the size of our grain cart is unique. If you can unload 1,000 bushels directly into a semi, skipping the cart and the tractor, you can do it in as little as 2 minutes. That’s 8½ bushels per second, more than twice the speed of any competitor machine. Kris Polly: What is the diameter of the auger on your machine? Greg Terjesen: It is a 20-inch-diameter auger. We reduced this from 22 inches, and fit it with a bigger motor. Right now, the Tribine has two 9-liter Cummins engines. It used to have a 6.7 liter and a 9 liter—the 6.7 for propulsion and the 9 for the threshing and cleaning system—but we were not getting the horsepower that we needed to hit our own milestones. One of those is a roading speed of 30 miles per hour, towing a header on a cart. So we made an upgrade at the end of year one and replaced the smaller engine. Now we have two 9-liter engines that are saddled on both sides of the threshing and cleaning system. The efficiency and fuel economy on two smaller engines is much better than on one large 16-liter engine. When you are roading the machine, the engine that drives the cleaning and threshing is just idling. So you don’t have a 16-liter engine running at 2,000 rpm, you have one engine that is running 2,000 rpm and another at 800 rpm. Another benefit is that they use the same parts. Kris Polly: What is the thinking behind reducing the auger size from 22 inches to 20 inches? Was that part of the twin engine effort? Greg Terjesen: Yes, it was, and it was part of our goal of being able to unload 1,000 bushels in 2 minutes. People are always coming up to us and asking whether we can actually unload 1,000 bushels in 2 minutes. Well, we did a test with a stopwatch and a drone and unloaded 1,025 bushels of wheat in exactly 2 minutes. There is a video of that test on our website. 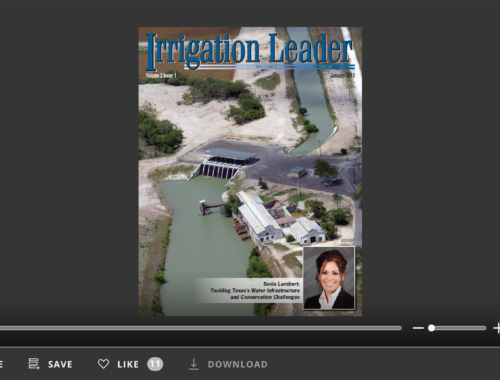 Kris Polly: What is the length of your auger? Greg Terjesen: The discharge auger is 26 feet long, so we have no problem getting up to the truck for easy unloading. Kris Polly: Why did you decide to put the auger in a tube? Is that a structural component? Greg Terjesen: It is a structural component. The auger that goes underneath the feeder that goes back into the grain cart is rigid. When you use the articulated steering, the machine actually moves over that auger using the articulation joint. It has two tubes: an exterior tube, then about a quarter-inch gap, and then the interior tube, which holds the auger. The auger tube gets stressed because of the speed at which the auger is moving all the grain, which is why there is a gap between the inside and the outside tube. The outside tube, which is ⅜-inch thick, is there for structural stability. We call it our drawbar auger, because it connects the two modules. Globally, we currently have over 40 patents on this machine. Kris Polly: Can you please describe the tires on the Tribine and how they affect compaction? Greg Terjesen: We work with Titan Tires, which has developed what it calls a low-sidewall tire. It is pretty much a floater, but they call it a low sidewall. What makes it unique is that as you fill up your grain cart, the tire goes down about 7 inches. That increases the size of the footprint: The footprint gets wider, but more importantly, it gets longer, so the weight is spread over a much larger area. Compaction is based on nothing but a simple formula: the size of your footprint divided by the weight of your machine. When we were working on the Tribine concept, our previous prototypes had a much smaller footprint. We contacted Titan, and lo and behold, it was working on this new technology and it was a perfect match. Thinking about harvesting in high moisture, people look at the Tribine and say, “Doesn’t that get stuck because of its size?” The answer is no. The farthest we have gone into mudwas in Ames, Iowa, at a customer’s farm. They had had 4½ inches of rain the night before we arrived. We originally were not going to run, but the farmer asked us to show him what the machine could do. We said that we were not afraid to run it in moisture, but we did not want to damage his field. He responded that that was his problem; he really wanted to see us run, and we did. With these tires, the only thing that really sinks down are the cleats; beyond that, it really does not sink. In addition, we have four independent planetary hydraulic motors, one inside each of the rims. This gives us full-time all-wheel drive. It also creates some simplicity in the drive system and gives the machine a tremendous amount of traction. We also have the center articulation for steering coupled with the rear-wheel steering engaged from the cab. You do that simply by twisting the joystick, which allows you to crab the machine. You can offset the front module from the rear module and you can crab the machine sideways up to the semi for unloading. The discharge auger goes out 90 degrees plus another 17, so with the lengths of the discharge auger and the maneuverability you do not really need grain carts. Our biggest header is a 40-foot MacDon that we run on wheat and beans. There is plenty of clearance to maneuver the machine up to the semi, even with the 40-foot header on it. Kris Polly: I was really impressed with the machine when I saw it—it truly looks made to last. Did farmers have a role in designing it? Greg Terjesen: Yes, about half of our engineering staff are farmers. Our founder Ben Dillon and his family have been in farming since 1840. We also received plenty of input from local farmers as we went through the development process. Kris Polly: Well, you have created something special. The boost of efficiency that the Tribine can provide farmers is impressive. Greg Terjesen: That is our whole concept. We will be the first ones to tell you to park your grain cart and unload directly into the semi at the end of the field. With all the new GPS, technology, and software on the market today, it is very easy to lay out a field, and if you are running, for example, 200 bushels of corn, you know exactly where you need to park your trucks. A standard combine can go down the field and back, and then it has to be unloaded because it can only hold 350-400 bushels. We can go down and back and down and back again before unloading. With farmers’ demands for higher yields, 300 bushels per acre is right around the corner. There are guys right now running 250 bushels of corn. 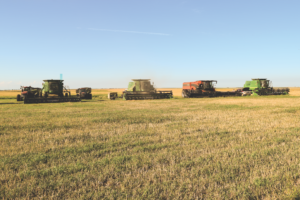 Kris Polly: Folks will say that although you have eliminated the grain cart, you have also reduced the time that the combine is actually harvesting. With a grain cart, you unload on the go and that the machine never stops. What is your answer to that argument? competitors. You do slow down as you unload on the go into a grain cart, but that is more than offset by the cost of the grain cart and the salary of the guy driving the tractor. Most farmers will not get rid of their tractor—it is such a necessary tool on farms these days—but do you really need a grain cart? There is an initial cost, and you are burning fuel in it and depreciating it. We say that the price of a Tribine is equal to the price of a competitor machine and half a grain cart. In fact, our competitors’ prices have gone up quite a bit in price in the last 12 months. If you look at hard numbers, the Tribine is probably about $40,000 more than a class 9 competitor machine, and yet the Tribine is a class 11 machine. We are the only ones with a class 11 machine. Kris Polly: Would you explain to our readers what a class 11 is? Greg Terjesen: The Association of Equipment Manufacturers classes combines based on horsepower and the size of their grain carts. There is no machine in the same class as the Tribine. Ours is 650 horsepower at a continuous rating. People play games with the horsepower numbers. Don’t get me wrong: I have respect for our competitors, and I know that they would not be where they were if they did not put out good products, but when someone is saying that their peak horsepower is 550 I immediately ask what their rated horsepower is. If they ran their machine at peak horsepower, they would have to replace the engine every month. The real number you have to look at is the continuous rated horsepower. The Tribine, for example, with the two engines is 650. A green machine’s continuous rating is 525 horsepower. They will boost that up and say that they have 560—well, that is the peak rating. You are only kidding yourself if you publish that number. 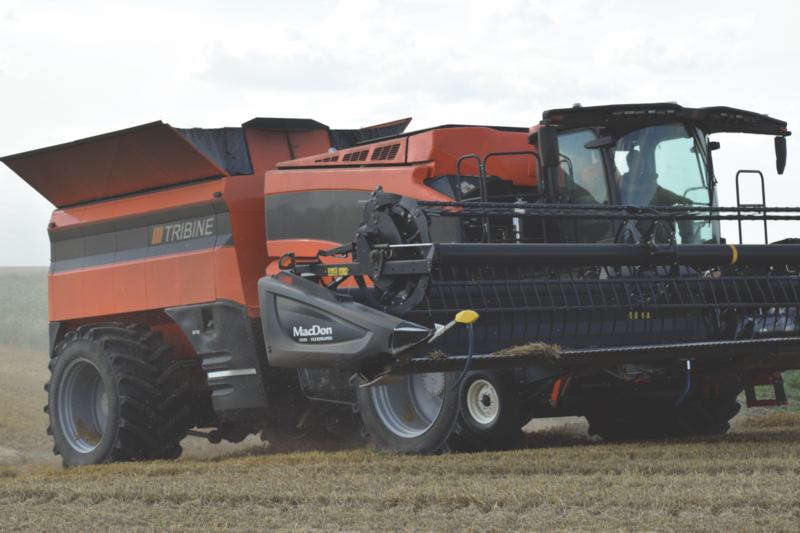 I could very well go out and publish that the Tribine’s peak rating is 720 horsepower, but that is a misleading number, and I would be doing a disservice to customers. You need that peak horsepower if you are on a steep slope, and we have been on some pretty steep slopes during testing this year, but nowhere will you see us publish 720 peak horsepower. Kris Polly: What is the width of the axles on your machine? Greg Terjesen: The width of the machine is 14 feet, 7 inches from side to side, measured from outside the tires. In some states, believe it or not, you can actually put something that wide on a semi. In Kansas, you can do that, but if you go to Illinois, the state trooper is going to stop you immediately, so there we have to take the tires off to move the machine. It is not that difficult; we actually have a patented tire-handling system, and we can take all four tires off with just a forklift in about 30 minutes. Kris Polly: How wide is the Tribine compared to ompetitors? Greg Terjesen: We are a little bit wider because of the tires. One thing you have to remember is that at present, we are only marketing the Tribine in North America. A machine of this size and width would never work in Europe because they have much stricter roading regulations. When you realize that some of our competitor machines are built there, you understand why they are less wide. Kris Polly: How long you have been in business? Greg Terjesen: We have officially been in business for 3½ years. We have started to target our machines in five states: Indiana, Illinois, Iowa, Kansas, and Nebraska. We are trying to sell directly to farmers. Everyone who buys a machine gets a dedicated phone number: There is one point of contact per machine. Someone will be accessible at that number 24/7. My background is from the construction-equipment side of the business. If you have a machine like a backhoe down on a site, you can bring in a small excavator to do the same job. If you have combine down, you are facing a ticking clock, because Mother Nature dictates when you have to harvest. Not everyone has a 54,000-pound machine standing around that they can just send out to a customer. It is a lot more complicated on this side of the fence than on the construction side. When I started, I was talking to farmers, and I asked them what some of their biggest challenges were, and every one of them told me that product support is a major challenge. A lot of farmers run these machines 18 hours a day in the middle of the harvest season. The other thing that you will notice is missing from the Tribine is a steering wheel. Where the steering wheel would have been, we put a glass floor so that you can actually look down on your header and feeder house and get a perfect overview of everything that is going on. That is where the grain is coming in, and if there is going to be a clogging point, that is going to be where it is. Construction equipment suppliers have been using joystick controls for the last 15–20 years, but the concept is being adopted by agricultural equipment providers as well. Now you can buy a John Deere motor grader without a steering wheel; it has a single joystick for steering, just like the Tribine. The other thing we did with the cab design was to wrap the glass around all the way to the back sides of the cab. There is a camera and a light at the end of the discharge auger. There is also a camera and sensor inside the grain bin. The farmer can just turn his head to the left and see the end of the discharge auger. He does not have to be concerned about seeing it on a monitor. We have made a lot of changes over the 3 years since we introduced the Tribine at the Farm Progress Show in 2016. We learned a lot during our prototyping from our customers, including our very loyal following on social media. If it had not been for input from those customers, our machine would not be where it is today.